Every single life is beautiful, unique and precious and it on this note that UnikBlends supports the Keep Dignity Alive campaign, which aims to empower women and girls to make the right choices. My name is Christy Aikhorin, a wife and a mother of 2 kids, the oldest is a girl. I am the founder of UnikBlends, a social innovative platform, that promotes the use of sustainably sourced fabrics which are handmade using traditional, more environmentally friendly processes from West Africa. These fabrics, which include the handwoven Aso-Oke, Geles, batural dyed Batik and Tie & dye, are typically handmade by women. As a woman and a Nigerian, who is passionate about transforming ideas into sustainable realities, I believe in empowering people, women in particular, to use their authentic talents and skills, to make a difference in their lives through the use of the Bold, Bright and Beautiful fabrics from Africa. Therefore, in retaliation to Trump’s recent #shitholes remark about African Nations, I was compelled to turn things around and find the positivity through such a cruel remark. It doesn’t matter where we come from. What matters is that we can all be bound in love and spread a positive, civilized and empowering message. So, here’s the deal: 40% of the sales from our UnikBlends LOVE T-shirt goes towards funding the #keepdignityalive. 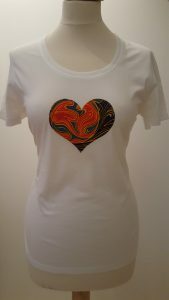 UnikBlends’ target is to raise 350Eur, which is enough to support 7 women in making in difference in their young lives. Keeping to UnikBlends Sustainable Ethics, the heart shapes are delicately and lovingly handmade from recycled/scraps of bright coloured fabrics instead of discarding them off as waste. The symbol itself, is a reminder of the power of LOVE, which we all need to make this world a better, safer and happier one. Christy Aikhorin, is a wife and a mother of 2 kids, the oldest is a girl. she is the founder of UnikBlends, a social innovative platform, that promotes the use of sustainably sourced fabrics which are handmade using traditional, more environmentally friendly processes from West Africa. These fabrics, which include the handwoven Aso-Oke, Geles, batural dyed Batik and Tie & dye, are typically handmade by women.